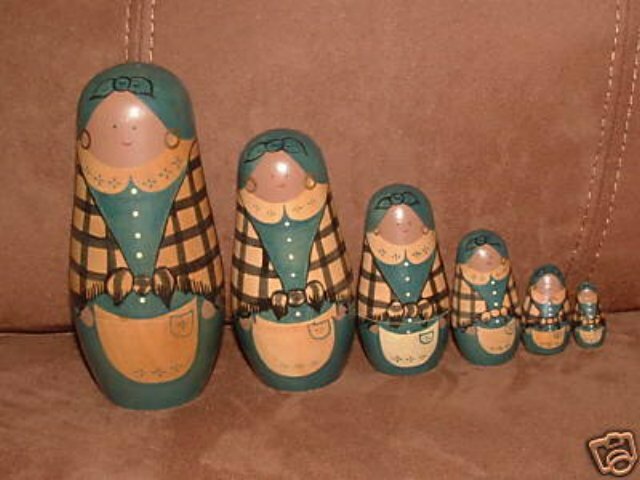 Six Piece Susan Kay Mammy Nesting Doll Set. The largest doll is approximately 5" tall. The largest doll is signed on the bottom "Susan Kay & Co. 1987 SKL 1990". They are in excellent condition. The smallest doll opens up and is not solid. The set was purchased new from Susan Kay along with another set, and neither set had a solid doll as the smallest.